The PINS statistics for 2009 are almost unbelievable. 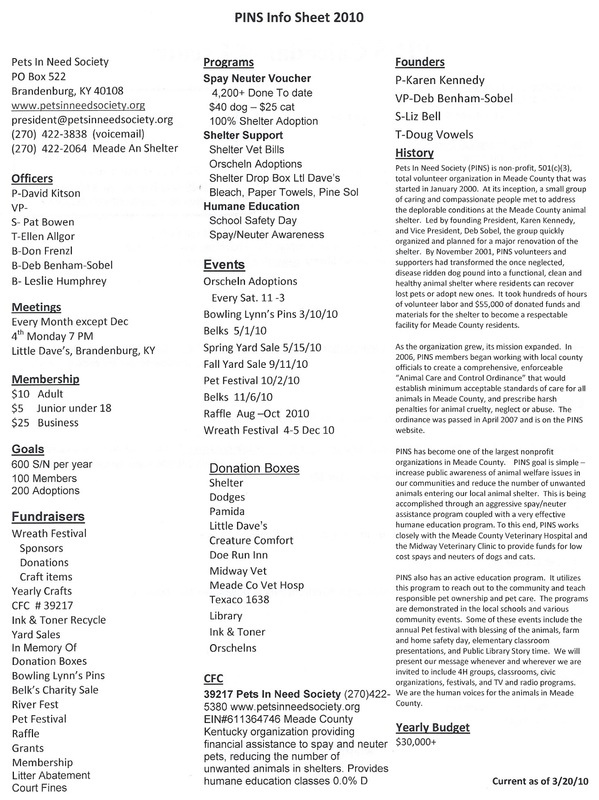 PINS, for the first time exceeded our goal of 600 and spayed or neutered a total of 617 cats and dogs in Meade County this year, for a total cost to the club of $27,150. Since the inception of PINS, the number of animals that have been fixed each year has increased from 62 in 2000 to this year’s high of 617. Included in the 617 animals served this year, 193 of them were adopted from the shelter. Simply stated, that is 617 animals that are not adding to the cat and dog population of Meade County, and 193 innocent animals that did not need to be put to sleep. Can you imagine how many stray animals we would have in our area if not for this program? PINS is having a direct and positive impact on this community. Since implementation of the spay/neuter program in 2001, there has been a significant decline in the total number of unwanted pets entering shelters, as well as fewer unwanted puppies and kittens born in the county, or running loose. 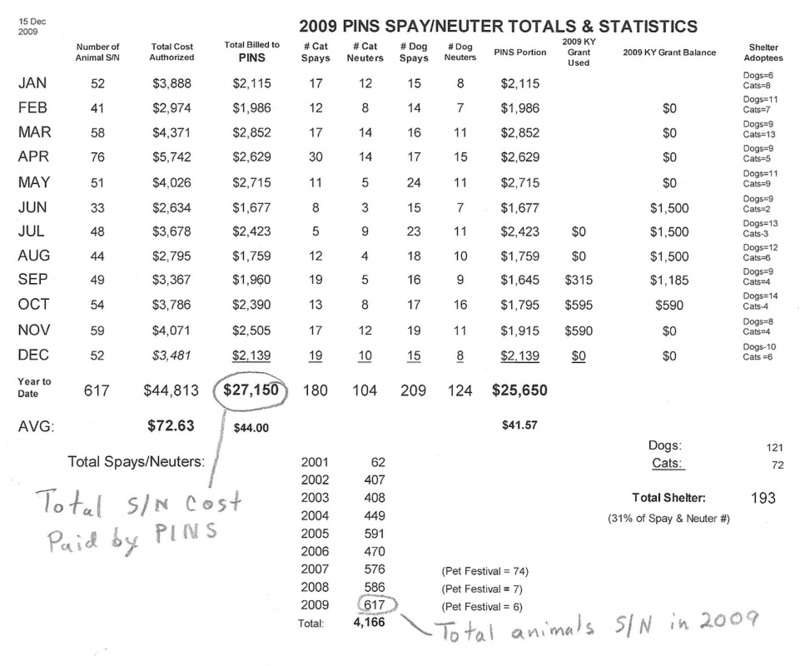 To date, PINS has helped spay or neuter a total of 4,166 dogs and cats in Meade County. PINS does this by providing financial assistance to pet owners who cannot afford to pay the full costs of spay/neuter surgery. No pet should be allowed to breed simply because the owner cannot afford the cost of this procedure. In July of 2009 Orscheln Home & Farm Store offered PINS the opportunity to show Meade County Shelter animals in the store for adoption. Member and Animal Rescue and Transporter Connie Mullins sprang to the call. She quickly organized transport and volunteers to show and adopt animals at Orscheln. Her efforts has resulted in the adoption of over 150 animals in just 6 months. As mentioned in the beginning of this article, PINS paid over $27,000 to have Meade County dogs and cats spayed or neutered. As PINS is a registered nonprofit organization, all expenses must be raised by the members. To meet the costs of maintaining the PINS programs, many hours are spent by the members preparing for and working at local fund raisers. We have an annual bowling tournament at Lynn’s Pins. The spring and fall yard sale helps with our fundraising and we collect items all year for this. Thanks to our members and supporters donating items, PINS earns about $1,000 at each yard sale. A simple way to help PINS all year long is to drop your loose change into one of our collection boxes (a miniature dog house) at 12 various local businesses. Small things add up! Of course, our biggest fund raiser is the annual wreath festival at the courthouse which begins the first Sunday after Thanksgiving. This festival, with its generous business and individual sponsors, earns around $8,000 annually. As you can see, PINS must work very hard to meet the budget each year.